For the past decade, New York artist Richard Dupont has been using the form of his own body as the subject of an extreme examination. Yet unlike traditional self-portraiture or anthropological observation, Dupont’s artistic activities involve the examination of digital copies of his body rather than the body itself. 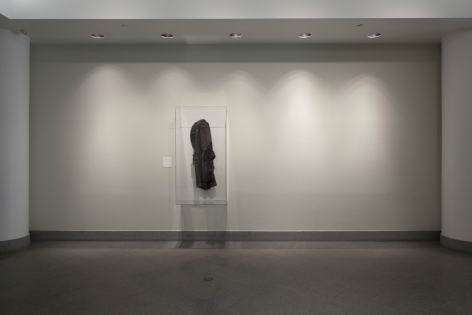 The raw material for this investigation, a body scan done on a military base, has been the solitary template for a wide variety of work in disparate media including sculpture and installation, printmaking, drawing, digital animation and painting. This ten year exercise amounts to a sort of gesamtkunstwerk of negation, as one is left,after examination of all of the evidence, with no clearer sense of the subject. Since 2001, when he began experimenting with digital scanning and 3D printing, Dupont’s work has mirrored the degree to which digital technology has infiltrated our lives, redefined culture, and transformed identity. His work reflects the extent to which the commodification and virtualization of the body have become commonplace in our culture of “self-surveillance”. Dupont’s work also has a strong material and physical aspect, which belies his involvement with digital processes. Traditional materials and techniques such as plaster and bronze casting play a role, as do the use of experimental techniques and materials such as cast polyurethane and silicone, 3D printed resins, digital scanning, and the manipulation of found objects. 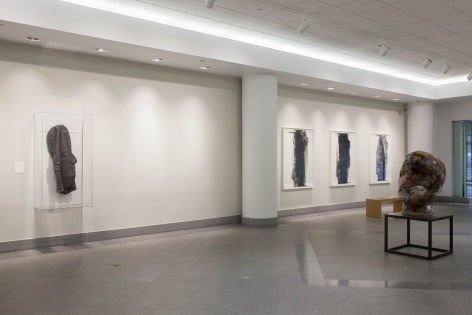 For the Queens Museum (Bulova) exhibition, Dupont will present a recent selection of his large format oil stick on paper drawings and a large format copperplate etching alongside two recent sculptures. Dupont has referred to his sculptural work as “anachronistic.” The continued engagement with sculpture and object making in an otherwise digital culture can seem like a ritual enactment of some previous history. Dupont’s exhibition, Object Ritual, extends beyond the parameters of his experimentation with sculptural materials and processes, and reflects his engagement with material culture and the anthropological. In the exhibition, this manifests itself most clearly in the monumental sculpture, Cabinet, from 2012. 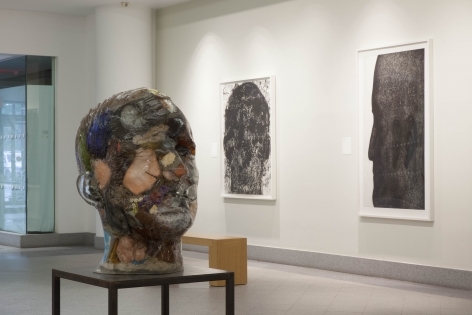 A solid cast 700 lb form based on a digital enlargement of Dupont’s life mask, the work was created by placing found and recycled objects, collected over a period of ten years, into a massive silicone mold, and then filling the mold up with archival resin. Also included will be one of Dupont’s rubber mask pieces. This recent wall hanging sculpture was made by brushing silicone rubber over the same digital enlargement used for Cabinet, and then peelingthat rubber off like a “skin” of material. That large deflated form hangs on the wall in counterpoint to the monumentality of Cabinet. The juxtaposition of these two opposing sculptural strategies highlights both the dialectical and reflexive nature of Dupont’s working methods; which often involve reusing and reimagining earlier works to create newer works. Richard Dupont is an American artist who lives and works in New York City. He works in a variety of media including sculpture, drawing, installation, painting, and printmaking. His work is currently featured in a major exhibition at New York’s Museum of Arts and Design (MAD): Out of Hand: Materializing the Postdigital. In addition, Dupont’s 15 –foot- tall cast aluminum public sculpture Going Around by Passing Through is installed in front of MAD on Columbus Circle through September 3, 2014. He received a BA from the Departments of Visual Art and Art and Archeology at Princeton University. 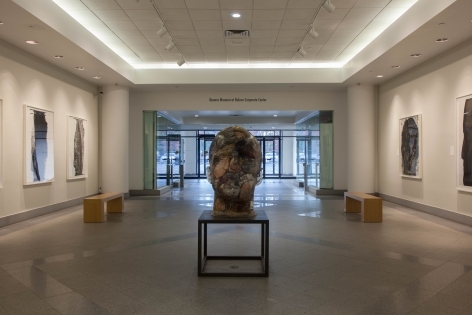 His solo exhibitions include The Middlebury College Museum of Art, the Hudson Valley Center for Contemporary Art, and The Lever House Art Collection. His works are included in the collections of numerous museums including The Museum of Modern Art (MoMA), The Whitney Museum of American Art, The Museum of Fine Arts, Boston, The Brooklyn Museum, and The New York Public Library Print Collection. This exhibition is organized by Manjari Sihare, Queens Museum Curatorial Manager.